Yudrug is a popular Tibetan band from Machu, eastern Tibet. ‘New Generation’, released in February 2010 as a gift to Tibetans on the Tibetan Lunar New Year, is a declaration of Tibetan pride. In May 2010 the report ‘A Raging Storm‘, by International Campaign for Tibet, brought to the attention of the world some 31 Tibetan writers, singers, bloggers, intellectuals who were detained or sentenced after expressing views, writing poetry or prose, or simply sharing information about Chinese government policies and their impact in Tibet today. Since the report was issued other writers and singers have been detained or harassed by the Chinese authorities. To read and listing to a number of them view Music and Writings. The crackdown against Tibetan culture is just a part of China’s strategy to stop resistance within Tibet. In the following essay Bhuchung D. Sonam illustrates how China use music themselves to convince the world that they have won the hearts and minds of the Tibetan people. Tashi Dhondup — a gifted 30-year-old singer from Amdo in north-eastern Tibet. “In September 2008, Tashi Dhondup — a gifted 30-year-old singer from Amdo in north-eastern Tibet — was detained at gun-point by the Chinese authorities while his wife wept and clung to a police officer’s legs in an attempt to save him. Dhondup was accused of composing ‘subversive songs’ with ‘counter-revolutionary content’ in his music album Torture Without Trace. He was detained and beaten for over a week by police in Xining. Ever since the People’s Liberation Army first marched into Tibet in 1949-1950, the Chinese Communist Party (CCP) has used propaganda to legitimize its occupation of Tibet and educate the masses on the virtues of its version of socialism. One means to achieve this has been music which overcomes the language barrier and has the power to convey any message immediately. Taking a cue from Lenin, who said that literature and art are “a screw in the whole machine,’’ the Chinese authorities have employed music as a core component of State propaganda. In the 1950s and ‘60s massive public song-and-dance campaigns were staged to disseminate political ideology through lyrics and to convince the people of the supposed benefits the CCP had brought to the people. “Music is no longer an end in itself, but a vital weapon in the struggle,” said Mao while encouraging a ‘cultural army’ of musicians and other performing artistes to carry out large-scale uniformed performances with ‘passion and conviction’ to spearhead the revolution. Dance Troupes — mostly composed of young Tibetans taken to China and trained by Chinese teachers to sing in high-pitched Chinese operatic style — were used to disseminate ideological and political propaganda. These troupes travelled to the remotest regions throughout Tibet to stage ‘developed’ and highly-sinicized versions of traditional music dressed in hybridized costumes. During the Cultural Revolution (1966-76) the traditional performing arts were completely banned. Anyone singing Tibetan songs were forced to undergo struggle sessions and publicly humiliated as harbouring ‘bourgeois habits.’ Even Dance Troupes were ordered to sing only Communist songs approved by Beijing. Tibetan music and the performing arts never recovered from the years of damage, exacerbated by the decade of political and cultural mayhem in the form of the Cultural Revolution. Even Hu Yaobang’s liberal policies after his historic Tibet visit in May 1980 did little to heal the wounds. In today’s globalized world, Tibetan music is still used by Beijing to drive home political messages. Anyone not toeing the official line is barred from public performances, persecuted, arrested and imprisoned. On 10 March 1993, Zeng Jian-Hui, vice-minister of the Propaganda Ministry of CCP Central Committee said, “We should expand our sphere of influence; in particular, we should infiltrate our propaganda into the mainstream life of the west. Firstly, we should continue to send Tibetan scholars and Tibetan singing and dancing troupes abroad to lecture and perform.” ‘Singing and dancing Tibetans’ come as handy tools for PRC to expand its influence abroad, to legitimise its rule in Tibet, to prove how happy the Tibetans are in Tibet and finally to show that Tibetan culture is fully protected. This reverses reality. Like other aspects of Tibetan life, traditional music and performing arts are being stifled by constant official censorship, deliberate distortion and comprehensive sinicization. Tibetan musicians who do not reinforce Beijing’s propaganda and campaigns are persecuted. 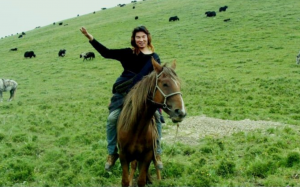 In January 2010, the authorities sentenced the singer Tashi Dhondup to 15 months’ ‘reform through hard labour.’ Earlier, in March 2008, another young Tibetan singer, Dolma Kyi from Golog, was arrested for composing and singing ‘reactionary songs’. Likewise, in May this year a list of 27 popular Tibetan-language songs were banned in Tibet, whether in audio or videodisk format, or as digital media files on people’s cell phones. “Anyone possessing the illegal music or videos will be severely dealt with,” the authorities warned. But no matter how harshly Beijing imposes its crackdown on Tibetan lyrics or how many times the CCP may smash the strings our danyen, songs will be sung and music will flow from occupied Tibet through the ramparts of the Himalayan range. In the video below Dr Robbie Barnett discusses the recent history of resistance through music, describing openly political music as being – until recently – quite rare in Tibet. One exception he refers to is the “beautifully poetic” collection of songs by the Drapchi Nuns, recorded in their prison cell in 1993 and smuggled to the outside world.